Keep your beverages cool with this selection of Ice Kegs. 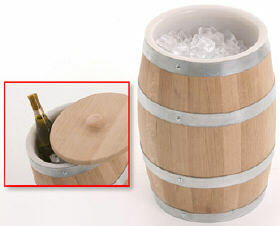 Avaliable in either a 5 or 12 gallon size and made from authentic, coopered American White Oak. These ice barrels are lined with a plastic sleeve to hold ice and include a lid. Ideal for parties, cookouts and promotional events. *Ships UPS Oversize due to keg dimensions Please note: Some kegs require 2-3 weeks for shipping due to the hand crafted process.